Welcome back to How’d They Do That? Each week, we check out behind the scenes stills and video from the making of some of cinema’s greatest! This week, I thought it might be great to look back on one of the greatest sci-fi comedies every created, and with the trailer for the reboot causing a stir across the internet, now seems as good a time as any to take a look back at the 1984’s amazing Ghostbusters. 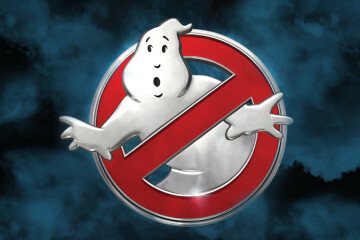 Originally titled “Ghost Smashers”, the genesis of Ghostbusters sits entirely with actor/writer Dan Aykroyd. 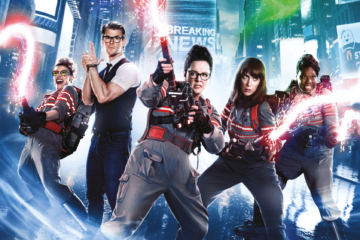 The film was originally envisioned to be much bigger than what ended up on the screen, with the Ghostbusters travelling through time, space and other dimensions battling ghosts and ghouls. With an initial draft done, Aykroyd took his script to director Ivan Reitman. 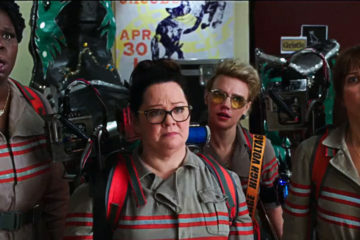 Reitman saw many budget problems with the scope of the existing script, and suggested that he and fellow actor/writer Harold Ramis give the story a major overhaul, grounding it reality and essentially making Ghostbusters the film we know and love today. Even though a lot of the super fantastical elements of the original script were removed, Ghostbusters is still vividly remembered by audiences for not only its amazing humor, but its fantastic visual effects. Lets take a look at how some of the famous ghosts and demons were created for this classic! 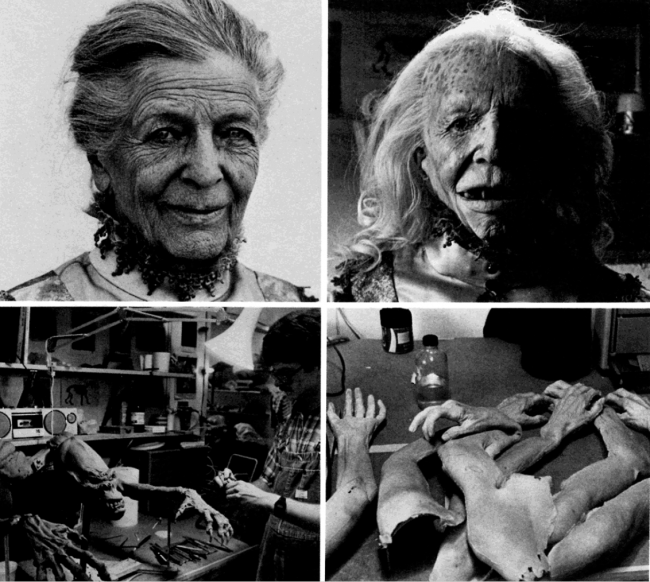 First, check out the below set of shots including makeup and creature effects for the ghostly librarian aka The Grey Lady, that the Ghostbusters encounter at the start of the film. In the top left, actress Ruth Oliver in her makeup ready to shoot, and in the top right, makeup effects in her transition to the demon she becomes after being touched. Originally, the demon form was designed to be scarier (bottom left), but after complaints from the studio it was toned down. The creature designed for this sequence ended up being used in Fright Night (1985). 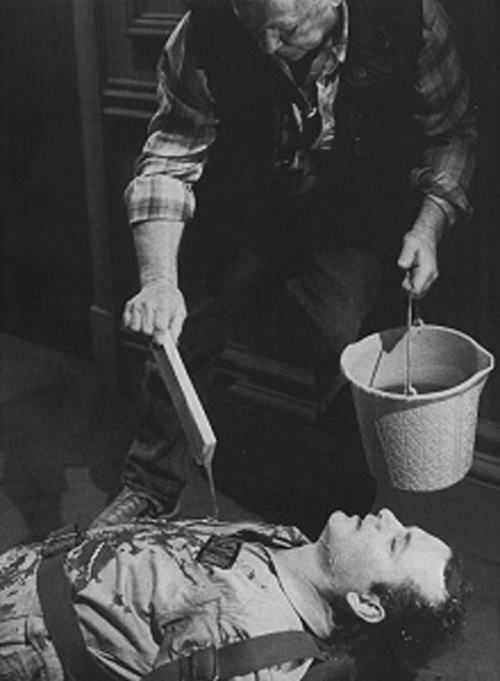 Below, Bill Murray has the slime applied to him during iSedgewick Hotel. I bet he’s feeling really funky right about now. Onionhead, or as he came to be known, Slimer, was described on set as the ghost of John Belushi. 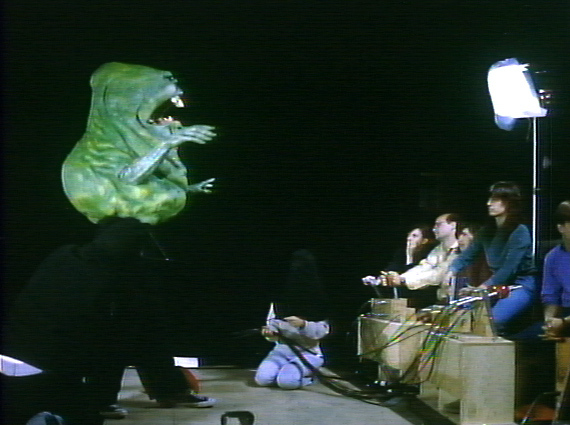 Here we see the effects teams puppeteering the Slimer puppet, to be optically added to scenes in post-production. The set of puppeteers on the right are operating the various facial features and movements via hydraulic cables. Rick Moranis is wonderful as Louis Tully, a role originally written for John Candy. Below we see the cast and crew, along with a terror dog puppet, ready for the next take. Take note of the guy standing behind Ivan Reitman (sitting in the directors chair). That Wolfman is not an effect. 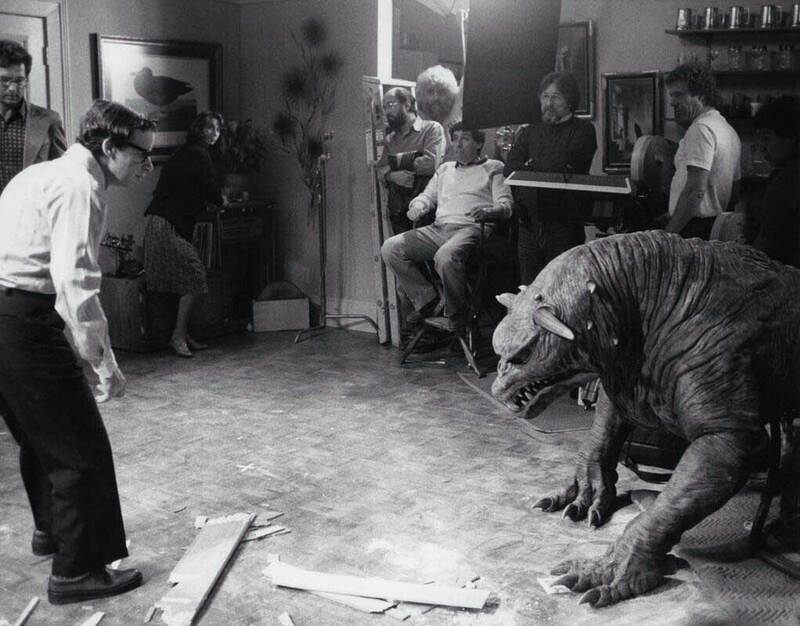 Below is a great still on the creation of the demons taking Dana (Sigourney Weaver). I love how simple this effect is, just take a couple of creature arms and some crew and voila, you’ve got a demonic possession sequence. Get possessed by demons and become a magic trick. Literally. 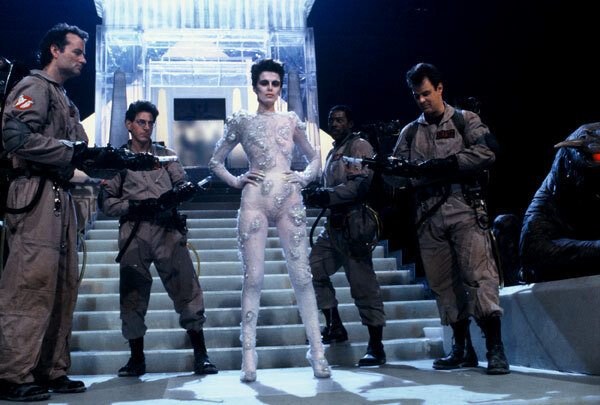 To pull off the levitating illusion, Sigourney Weaver was put in a full body cast and attached to a post that was hidden behind the curtains. Another simple trick at play. Here we see the team on the rooftop set (filmed entirely on a back lot sound stage), getting ready for their final confrontation with Gozer the Gozerian, played by Yugoslavian model Slavitza Jovan. Slavitza spend many hours in the makeup chair every day, could only wear the red contacts for 20 minutes at a time, and even had to be sewn into the suit on set. Below, Bill Murray and Chevy Chase goofing around on set, carefully watched by the Terror Dogs. 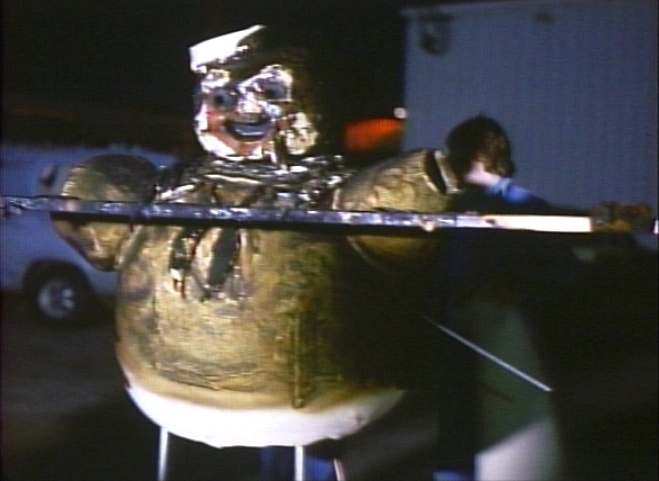 The final highlight of the film, is the wonderful confrontation with Ray’s selected destructor form – the Stay Puft Marshmellow Man. Created with a combination of miniatures, puppetery and good old ‘Man in Suit’ – Mr Stay Puft fell from the Shandor building and into the hearts of audiences around the globe. Here we see effects artist Bill Bryan getting suited up to perform. 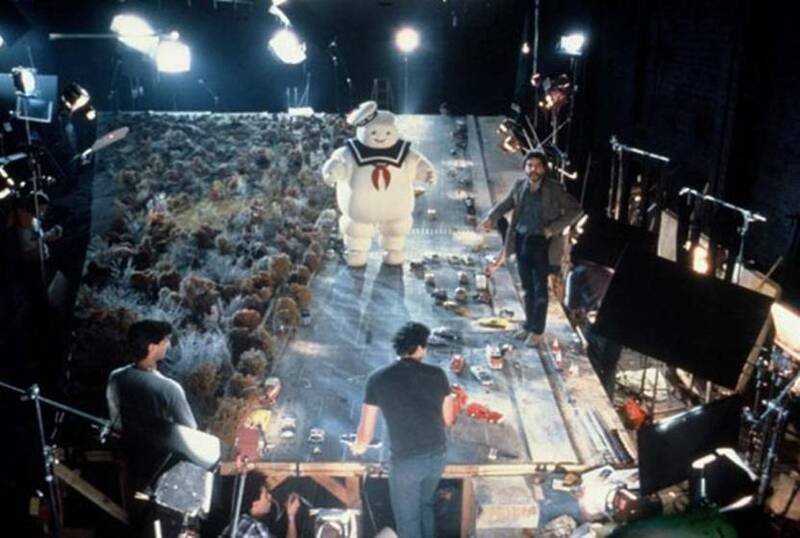 Check out this great shot of miniature Central Park West as we see Mr Stay Puft lumbering up the street on his way to battle the Ghostbusters. This is one of those shots that doesn’t exist often anymore. The scale and scope of the miniature set really adds to the size illusion. The amount of time and effort that has gone into getting this single shot is just another reason why I love the art of filmmaking! 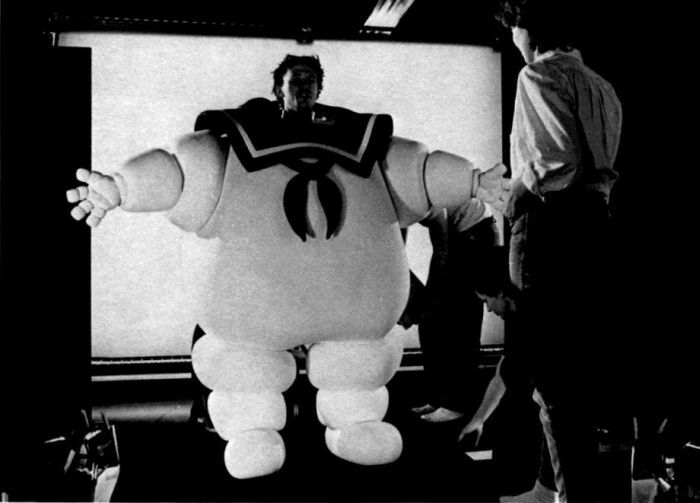 Poor Mr Stay Puft. 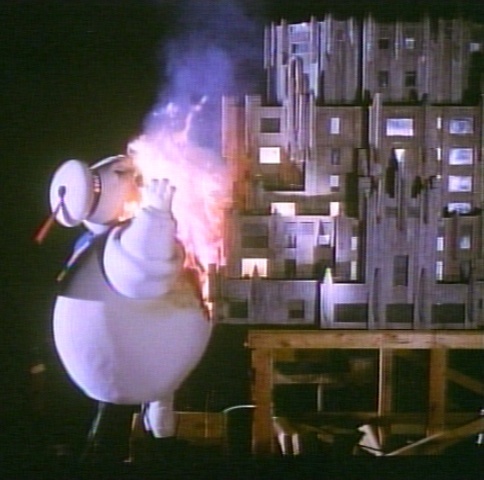 After being blasted by the Ghostbusters, the burning marshmellow monstrosity continues to climb the side of the building. Check out the performers legs at the bottom of the costume! And finally, a shot to haunt your dreams. The crisp Mr Stay Puft costume, still very happy looking, even though a trip to the plastic surgeon seems to be in order. Ghostbusters is one of those films that has a ton of behind the scenes photos out there, so if you like what you’ve seen, be sure to Google away! Say what you will about the reboot, but it looks like they’ve got a really good feel for the ghost effects, which is a great sign. 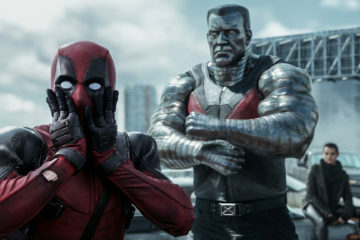 Lets hope it can pull some hints from the original film and really blow audiences away! 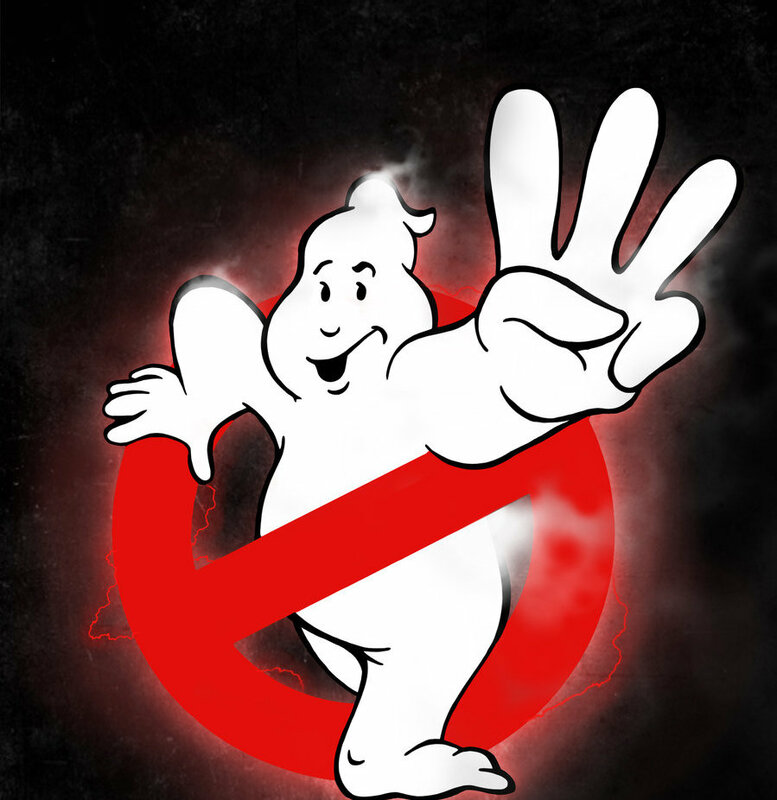 Got a favourite Ghostbusters memory? Feel free to share it in the comments below! Until next time, keep watching and asking How’d They Do That! BILL MURRAY SUITING UP FOR GHOSTBUSTERS REBOOT?